I have some new yarn to add to the stash - my current obsession, SweetGeorgia Yarns. I discovered this company a while ago when I saw a huge selection of Felicia's Tough Love Sock yarns at Three Bags Full. I've never knit with this yarn before but couldn't resist the gorgeous and very vibrant colours. So I gave in and bought a few skeins of the Boheme colourway cause it contained one of my favourite colour combos: pink and brown. I haven't had the chance to knit with this yarn, mainly cause I would rather pet and admire it than to actually use it for its intended purposes. After checking out the SweetGeorgia website and Ravelry group page, I was wanting more! To make my yarn lust even worse, my friend Natalie showed up at knit night one night in July with this absolutely beautiful yellow yarn. She told me it was the Superwash Worsted in Saffron by SweetGeorgia. 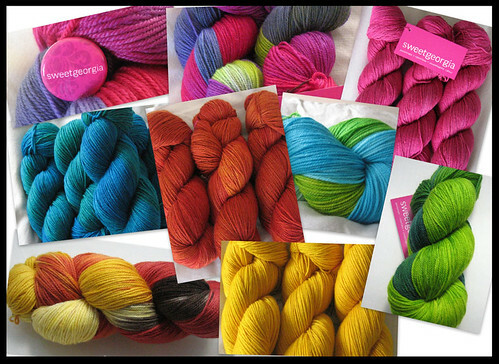 Ever since that night I've been seriously lusting after that colourway and have been dying to get my hands on some. During a trip to Vancouver I made sure to stop by Three Bags Full and snagged a few skeins of Tough Love Sock in English Ivy, which I am currently knitting into a pullover. So far, knitting with this yarn has been quite lovely. It feels fabulous as it runs through my fingers, and as dorky as this sounds, I get all excited whenever I see the shades of green transition from a deep forest to a gorgeous kelly. My excitement usually escalates whenever I'm knitting outside or in brighter light, cause then I can really see, marvel, and appreciate the depths within the yarn. I'm getting a little impatient with myself as to how slow I'm knitting this up cause I really can't wait to wear it. But I have to admit, this project has made me determined to get my hands on even more SweetGeorgia! Lucky for me, SweetGeorgia is a Vancouver based company that not only sells and offer shipping from their online shop, but they also allow for orders to be picked up at their studio. I hummed and hawed over which colours and yarn weights I wanted before checking out my Ravelry queue so that I can plan projects accordingly. Aside from Saffron (which I wanted to get in every single weight offered! ), I really couldn't make up my mind and ended up subscribing to the yarn club. Yeah...I got way off track there! A few days later I finally settled on a few colours and made my order. Before heading to the Okanagan I got to pick up my yarn order and on the way back to the island I managed to convince Brett to make a stop at Three Bags Full (again! ), where more SweetGeorgia was acquired. If you haven't had the opportunity to check out SweetGeorgia, I highly urge you to. If the different bases don't get you hooked, the colours will definitely lure you in. I don't think Felicia has made a colourway that I don't like. I'm just glad that no yarn shop here in Victoria sells SweetGeorgia, or I would definitely be in some major trouble. Mmm...after proof-reading this post, I've come to the conclusion that I have a problem. At first I thought it was a yarn-hoarding problem, but now I think it's a straight up SweetGeorgia obsession. Anyone with SweetGeorgia want to help me out? okay, I have two words for you: JEAL-LOUS! I know that's only one word, but that's how jealous I am!!! I've been loving knitting with that saffron yarn, and I think I may have to buy more sweater amounts in the future. I hope, hope, hope whe ends up paying us a visit here on the island!! Ohhhhh myyyyy look at those photos! How lovely that you took photos of all the yarn! And I hope this is good news... some of our yarn is going to Victoria later this fall... one of your local yarn stores :) And when that order is ready, I'm hoping to bring it over and show you guys the yarn in person. Fingers crossed... it'll be this fall! I really do hope you make it to the island soon! Can't wait! !